(AFP) – The European Union on Thursday condemned the shelling of a United Nations school and crowded Gaza market the previous day, urging an immediate probe into the “unacceptable” deaths of civilians. “It is unacceptable that innocent displaced civilians, who were taking shelter in designated UN areas after being called on by the Israeli military to evacuate their homes, have been killed,” the EU's diplomatic service said in a statement. 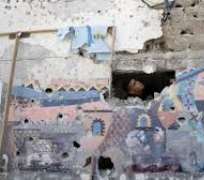 “These incidents must be investigated with immediate effect,” it said, referring to the shelling of an UNRWA school and the Shejaiya market near Gaza City. The EU was “deeply concerned at the catastrophic humanitarian situation in Gaza” and called on all sides to “immediately allow safe and full humanitarian access for the urgent distribution of assistance”.